Network International was created as a division of Emirates Bank in 1994 and has grown at an impressive pace in the last years, becoming the leading enabler of digital commerce across the Middle East and Africa (MEA) region. The company offers a wide range of payment products for both the Issuing and Acquiring segments of banks and its core business consists in processing payments for merchants in stores, allowing them to accept payments online. Network International operates in one of the world’s most underpenetrated payments markets: the MEA region, where it represents the only pan-regional provider of digital payments solutions at scale with presence across the entire payments value chain. Moreover, in March 2017, Network International expanded its presence in the region by acquiring Emerging Markets Payment from Actis, another private equity group, in a $340m deal. This testifies that the company is looking to expand rapidly in an industry where the majority of consumers in Africa and the Middle East are still using cash as payment. Warburg Pincus and General Atlantic acquired a stake in Network International from now-defunct private equity firm Abraaj Group and sovereign wealth fund Emirates Investment Authority in 2015, valuing the company at $1 – $1.5 billion including debt. Today, the two private equity funds jointly own a 49% stake in Network International, while Dubai’s biggest bank, Emirates NBD PJSC, holds the remaining 51%. The Dubai-based company provides services to more than 65,000 merchants and 220 financial institutions. Revenues at Network increased at an average rate of 13% between 2016 and 2018, to $298m, generating an underlying net income of $98m. 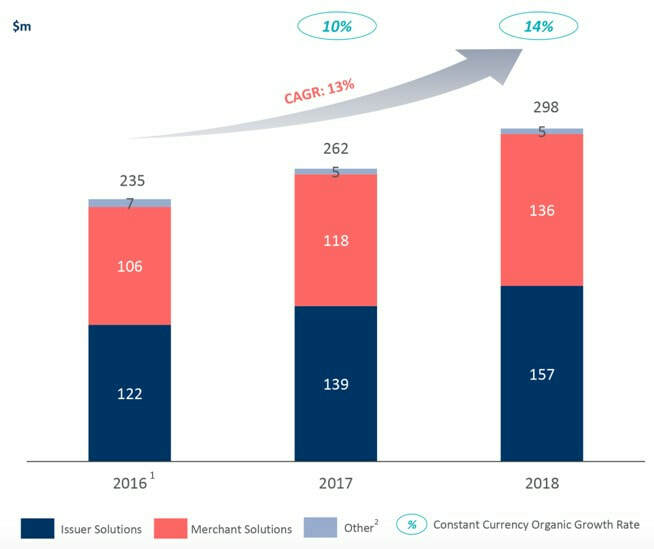 Revenue growth was mainly driven by secular trends in the region and growth of e-commerce, which accounted for about 20% of Merchant Solutions revenue in 2018 (see Exhibit 1). 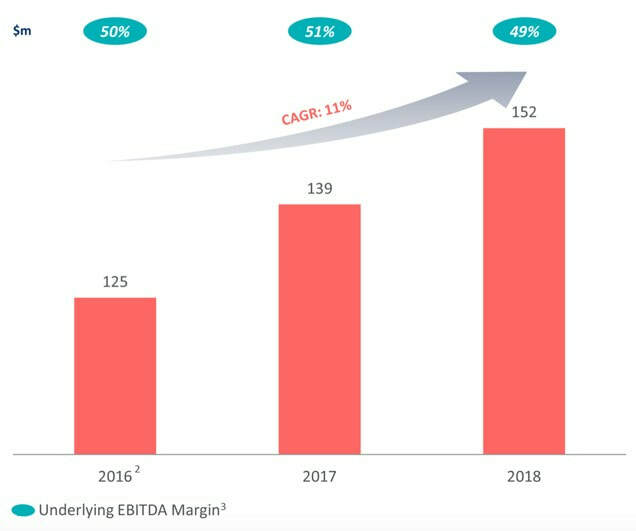 The company also saw underlying EBITDA growth of 11% annually over the same period, with a 49% underlying EBITDA margin achieved in 2018, driven by continued investment into products and distribution channels (see Exhibit 2). On the wave of these positive financial results and market outlook, Network International plans to list its shares in London next month in the first big initial public offering in the U.K. this year. The forthcoming IPO could value the company at about $3 billion and it expects to be eligible for inclusion in FTSE U.K. indexes. Financial details have not been disclosed yet, the company announced that the price range of the offer, along with the maximum number of shares to be sold in the offer “will be determined in due course and contained in the prospectus expected to be published by the company in the coming weeks”. The IPO will not involve the issue of any new stock. But its existing shareholders — US private equity groups General Atlantic and Warburg Pincus, and its former parent Dubai-based bank Emirates NBD — will sell at least 25% of the company. Moreover the company said that it has engaged Citigroup, JP Morgan Cazenove and Emirates NBD Capital as joint global coordinator and joint book-runner, with other book-runners include Morgan Stanley and Goldman Sachs. Moreover, the payments provider started preparations for the IPO by hiring Ron Kalifa, the former head of UK rival Worldpay as its chairman, on March 14th. He is one of the best-known figures in Britain’s payments industry, having led Worldpay for more than a decade. He is still an executive director at the British company, which was taken over by US group Vantiv in 2017. The company opted for a single listing in London instead of a dual listing in London and Dubai. This decision may have been driven by the fact that Eastern firms have a successful track record of listing in London. Abu Dhabi’s NMC Health Plc has surged more than ten times since listing in the U.K. seven years ago, according to Bloomberg. Moreover, Al Noor Hospitals Group Plc listed in London in 2013 before being taken over by Mediclinic International Plc. Finally, VPS Healthcare LLC hired Rothschild & Co. to advise on a potential London listing. Network International will be the first big company to list in Europe this year, testing investor appetite in a flat IPO market, where concerns over Brexit and slowing growth in Germany and France have helped push the number of IPOs at the start of this year to the lowest level since the financial crisis, with only $76.5 million raised this year compared to $2.7 billion in the same period in 2018, according to Bloomberg. Network will be joining peers including Nexi and SIA in Italy, which are getting ready for their own potential floats in the coming months. In particular, Nexi’s private equity owners - Bain Capital, Advent and Clessidra - want to list it with a valuation of about €8 billion, more than 15 times its core earnings. Like Network international, Nexi has seen impressive growth as revenues increased 15% in 2018 to €942m and EBITDA grew 8% to €419m. This testifies how payments processors have been in increasing demand in recent years as consumers worldwide switch to digital forms of payment from cash, determining impressive valuations and often achieving high returns for investors. For example, last year shares in Dutch group Adyen — in which General Atlantic was also a significant shareholder — nearly doubled in price on its first day of trading.